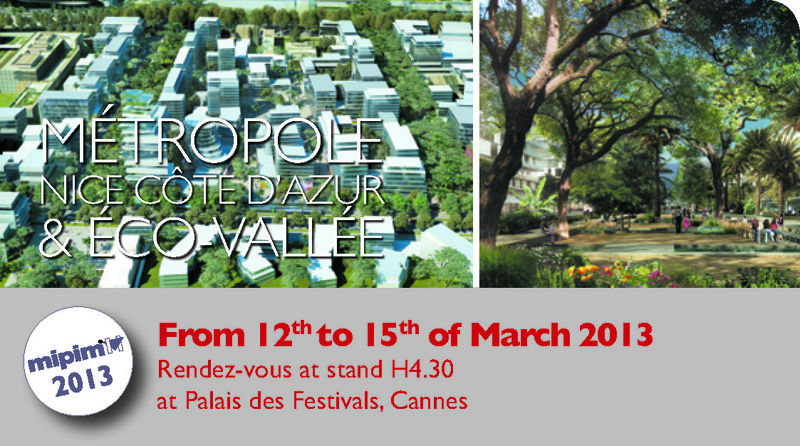 The MIPIM – the international market trade show for real-estate professionals – is the yearly must for any and all agents of the trade. Investors, promoters, architects, consultants, commercialising agents, territorial collectivities and prospective buyers will all be at Cannes during the show’s four days to present their projects and develop their commercial relations internationally. For the few thousand international attendees, the MIPIM is the spotlight event that allows real-estate investment to promote itself as a solid, long-term asset. The MIPIM has equally imposed itself as an inevitable space for the promotion of dynamic local collectivities desirous of growth by proving to various investors that they’re ready to tackle the same challenges international metropolises face daily. 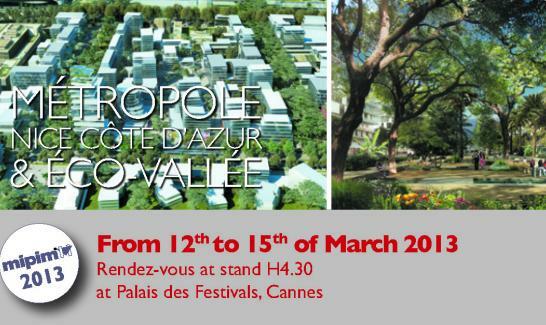 The EPA (urban development agency) plaine du Var exposes the two major development projects of the Éco-Vallée at MIPIM in Cannes from March 12th to 15th, alongside the Métropole Nice Côte-d’Azur. An occasion for the EPA to present a review of the Éco-Vallée’s situation, including the advancement of large-scale projects like Nice Méridia and Grand Arénas. - For the first time, the Nice Méridia model replica will be showcased, highlighting one of the principal economic development motors; a project that associates urban quality of life and functional versatility. This urban science park’s location enables it as a unique catalyst of innovation, offering development space in a downtown area. Serving R&D and education in the domains of sustainable development, environmental studies, health and contact-free mobile services, Nice Méridia is to work in synergy with the competences already installed in Sophia Antipolis. - A 3D application will enable a real-time visualisation of Grand Arénas, the new international business district and decisional hub situated adjacent to the Nice Côte-d’Azur international airport. At 10AM on March 14th, the model replica of the Nice Méridia district will be unveiled, in presence of Christian Estrosi, Mayor of Nice and President of the Métropole Nice Côte-d’Azur, Christian Tordo, President of the EPA Éco-Vallée and Christian Devillers, head architect and urban planner of the project.